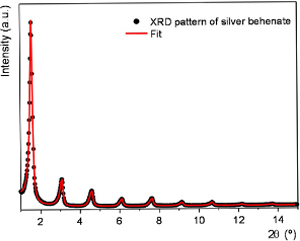 Having managed X-ray diffraction labs at previous jobs and in grad school, we know that there are a number of factors to consider when the time comes to add or replace an X-ray diffraction (XRD) system in your lab. Benchtop XRD systems may be a compact and cost-effective alternative to floor standing systems. Deciding which factors are key requirements for your needs will help you select a Benchtop system ideal for your situation. One of the key aspects of system performance to consider when buying a benchtop XRD system is resolution. Compact XRD systems typically have a smaller radius at which the X-ray tube and detector sit from the sample being measured, and this will impact resolution. There is a range of resolution performance available from the benchtop XRD market, so it is important to determine what will meet your needs. 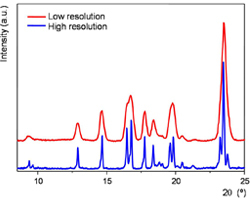 If your work is routine, involves a low number of phases in your samples, or you are looking at primarily nano-materials, resolution may not be critical to obtaining data of sufficient quality to meet your analysis goals. But, if you are looking at complex mixtures or looking for the presence of low amounts of polymorphs or trace phases, resolution should be an important factor in your evaluation process. The ability to distinguish small peaks will be critical for indicating the presence of unexpected or unwanted phases, in particular with patterns that have many peaks present. Resolution is reported as full width at half maximum (FWHM) of an early reflection from a suitable XRD standard (e.g. 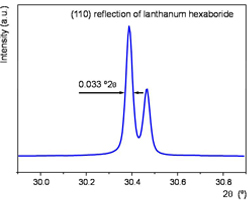 NIST SRM 660c – lanthanum hexaboride). The lower the FWHM, the better is the resolution. Excellent resolution for a Benchtop XRD system is less than 0.04 degrees 2theta FWHM. Another measure of performance is the linearity of the goniometer. A highly linear goniometer provides accurate peak positions over the entire 2theta range of the goniometer. This is important if you are making critical calculations from your XRD data, such as lattice parameters or unit cell size of a cracking catalyst. Linearity is determined using a line position standard such as NIST 640e – silicon powder. For a good peak position accuracy 2theta linearity should be within +/-0.02 degrees 2theta. Low-angle performance also varies from system to system. If you need to analyze pharmaceuticals or other organic materials, clays or mesoporous materials, low-angle performance should be high on your criteria list. Low-angle reflections will be key to correct phase identification and a requirement for accurate standardless quantitative analysis such as Rietveld analysis. Low-angle performance can be demonstrated with an appropriate low-angle standard such as silver behenate. Excellent low-angle performance would show clearly discernible peaks with correct intensity ratio down to 1 degree 2theta. A benchtop XRD system can have varying capacity to measure samples within a day. If throughput time is an important factor for you, it is worth exploring the possible options and select a benchtop diffractometer optimal for your needs. The allowed power settings of the instrument have a significant impact on throughput – operating at 40 kV instead of 30 kV improves measurement speed and thus throughput by 25%. Another way to reduce the measurement time is to use a high-speed line detector instead of a point detector. With optimized instrument setup measurement times can be as low as 5 – 10 minutes. With such quick measurements, you then may want to consider a sample changer on the system to alleviate the human sample changer. At a certain work load, it may also make sense to be able to use automation such as a robotic arm or a belt to feed samples into the system, or join the XRD system with sample preparation or complementary technologies such as an X-ray fluorescence (XRF) system. Automation may also refer to analysis software, which can be tailored to your needs and execute data processing, quantification, and report results to printer, network or LIMS system. If automation is desired for your lab, ensure it is a possibility with the XRD system you are evaluating. • a lab environment with a controlled range of temperature and humidity. Also, XRD systems may have power requirements requiring the installation of a new electrical service. Additionally, a maintenance agreement would be a recurring cost, but may be something to consider to keep your system in top running condition, or cover you for unexpected repairs. Read about more important factors to consider in this White paper.